Replacement Misting Device with Remote and Inline Controls. The ML-21 is a controllable mister with inline and remote controls. It features a 20mm ceramic disc size so it is technically able to produce moire mist than one with the smaller 16mm disc. The ML-21 Mister comes with a number of our misting fountains, but it can also be used by itself for other applications too. If your fountain stops working, you may need to replace the electronics, so this would be the part you are looking for. These devices usually last for years, but due to accidents, or heavy, prolonged usage, you may need to get a new one sooner. If the lights still work on your fountain, then you most likely only need to replace the ceramic disc, and not the whole misting unit. This item is for when you need a complete overhaul on your fountain. When it is operating, the ML-21 will act as a decorative focal point, but also a humidifier and air purifier too. When you add fragrance oil to the water, it will diffuse the scent into the air, allowing you to deodorize your home safely as it increases humidity and generates a thick cloud of natural mist. This clever little device is not magical, but when you look at it when running, you may think otherwise. 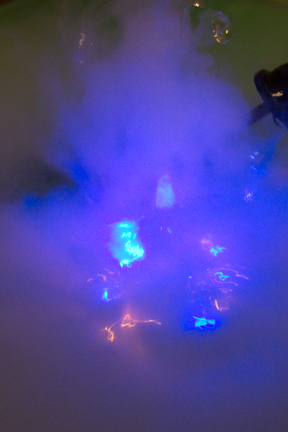 It does not use dry ice or any chemical formulation to make the mist. It is produced via ultrasonic oscillation where the ceramic disc vibrates at a high frequency in order to sort of evaporate the water on the surface of the mister. The result is a constant cloud of fine mist that floats on top of the water, and then dissipates into the air. When it is running, it also generates negative ions which help clean the air as well. 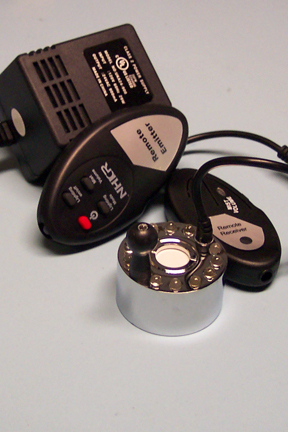 The ML-21 Mist Maker is equipped with a low water shut off switch, that automatically turns the mister off by utilizing a sensor that detects the water level. It comes complete with both inline and remote controls, so you can adjust the LED light show and mist volume with the touch of a button. Use the button set built into the cord, or operate it it from across the room by using the battery powered remote control. The 12 LED lights can be set to stay a solid color, rotate through 16 color combinations, fade in and out of a select set of colors, or strobe. You can also turn the unit on and off as well as set it to have the lights off with just mist. 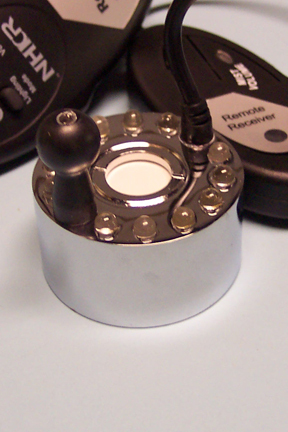 The ML-21 features a 20mm ceramic disc for higher mist output. Looking for a cheaper option? Get one without controls or a smaller disc size for less. The CH-24 Mister has a 16mm disc and is controllable. The JAS-20 Mister has a 20mm disc, but it is not controllable. Like the controls, but don't care about the remote portion? The CN-24 is probably a good choice for you. This small device produces a psychological feeling of calm and well being, and has the added benefit of generating negative ions which help to clean the air of impurities. It also increases the humidity in a room, which can help sufferers of colds, sore throats and asthma. Increased humidity can also be very beneficial to indoor plants. An ionizer, humidifier and aroma therapy diffuser all in one. Use the ML-21 to fix a broken mist lamp, or to make your own. Add this amazing device to any bowl of water to generate a natural cloud of mist. As soon as it is fully submerged in water, it will start to generate mist and display a dazzling light show. It is a great alternative to traditional humidifiers, and can also be used to enhance the look of indoor fountains and other water features. Order Yours Today! ML-21 Replacement Mist Maker- Repair a broken fountain or make your own with this replacement misting device kit. Submerge into any bowl of water to create a mesmerizing cloud of mist. Works good. Jest what I needed. Perfectly fit for my mister. Thank you! Love everything about this Mister. It's remote and has so many features. Love the different light shows it has and I can control the amount of fog it creates. I am very pleased with this purchase! The exact replacement I needed..quick shipment. They work great. I buy my own bowls and put 3 fountains together for Christmas presents. They loved them. Yes, I am happy to say that I am very much pleased with my purchase. It is working great. arrived in good time and condition. Thanks again. I really missed my fogger while it was out of commission. Definately a 5 star. FINALLY ARRIVED WIFE IS SMILING LOVES NEW UNIT. AS MY FRIEND ON DUCK DYNASTY SAYS EVERYBODY IS "HAPPY HAPPY HAPPY"
I was looking everywhere in town for that misting device. I had a fountain that is now working superbly. regulates the volume of mist - works great! This is the second unit we have owned int the past several years. Works lie a charm. Very decorative and functional. We use it for humidification in our large living room. To keep it functioning without too much maintenance, we use purified water with about an once or two of white household vinegar. Highly recommended at a fair price. We brought a mist fountain with us when we moved back to the US from Germany, but had to get a 110V adapter to power the mister - which didn't last long after that. I was afraid the only way to replace it would be to buy a new fountain (we like the old one) so I was pleased to find a replacement mister that we can use in the original fountain. It works fine and has more features than the one we had before. Guests love it. Everything was great for this order. It was shipped in a timely manner and it works just as advertised. Product is great, it is a nice upgrade from the original which worked for over 8 years, way beyond the life expectancy of this product. I bought 2. It sticks up higher than the originals I had, so the water level stays really full, so I waste a lot of the distilled water to dump out during cleaning. I like the remote, it comes in handy to just turn it off from a distance. The only set back was that I was not aware that the items were on back order, so it took almost a month to get the items, however the company was great about keeping me informed on the status and where bouts of my order. I love this unit, it is the most versitile unit I've seen, and the remote control makes it the most fun you can get with a fogger. 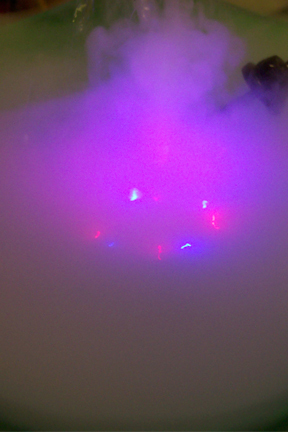 This makes a lot of fog/mist for a small unit, I am going to order a second unit for by indoor fountain. Can this unit be used in an outdoor fountain. If not do you sell an outdoor unit? Thanks! My mister went out probably over a year ago. The lights light up but no mist. I ordered the ceramic discs but it still is not working. Can you help? Sorry to hear this. If a new disc had no affect, then you may have a problem that can not be fixed. If you give us a call, we can help to determine what your options are. This unit looks exactly like mine. Everything works fine except for the lights and the fog is getting less. Can I just replace the silver unit and not the other 3 electrical/electronic attachments? Unfortunately, no. They are only sold as a set. Which colors can i choose between? Is there a clear color choice? You can set it to most primary and secondary colors, but not clear. exactly which colors can it be set to stay on? pink? orange? green? Yes, yes and yes. It can be set to most primary and secondary colors.